it's only natural to take our practice out on the Gulf! 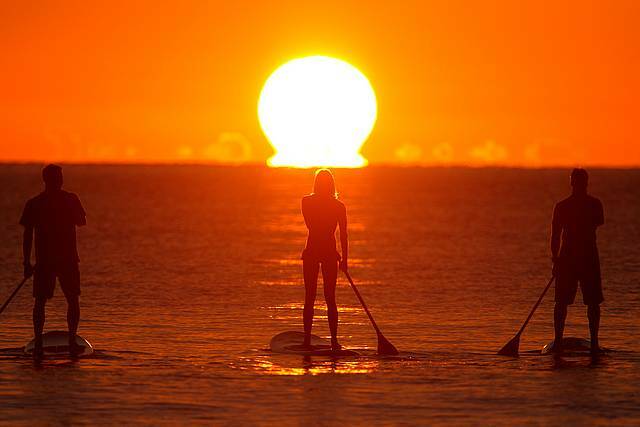 The practice of yoga on the stand up paddleboard creates a sense of being one with nature, a whole new perspective to being “fully present in the moment” and "Saluting the Sun". When you practice yoga on the water the board is your floating yoga mat. On Board transitions are slowed, core engagement emphasized and focus enhanced on proper alignment in order to maintain balance amid nature’s changing elements. True flow that will be carried back to your yoga mat. All classes are for beginners, more advanced by request or level of class. YOGA Pilates and SUP (Stand Up Paddleboarding) are all great for building better balance, coordination, endurance and body strength, a real adventure when put together! 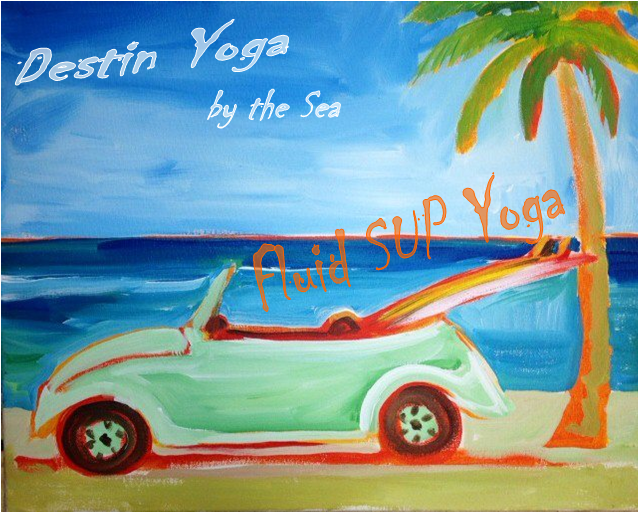 Take your downward-facing dog to the beach, bay, lake or the Gulf... 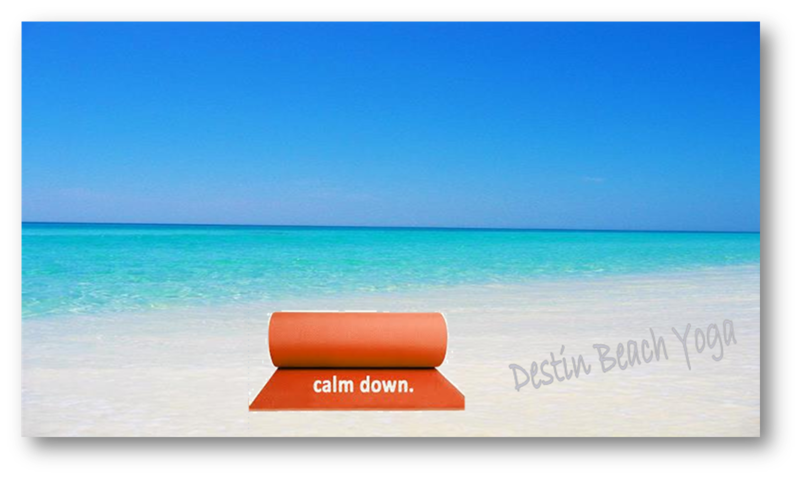 The Destin area has it all! For more than 5,000 years, people have been practicing yoga to find sama, the yogi term for balance, both mentally and physically. Most yoga lovers will test their ability to balance just about anywhere and on anything-a bench, a ledge, or even another person. 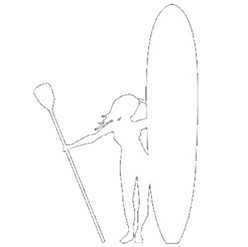 So given the recent trend in stand up paddle boarding (SUP)a workout in which balance is key, it's no surprise that someone thought to combine the two disciplines. First time out on a SUP board I had to try a Warrior I, humbling... feel in It became a fun mission for me a practicing yoga teacher of 20+ years to do a sun salutation on the board and than onto arm balancing. Nothing like floating in headstand. Still working on Warrior III, as more teachers got on paddleboards, yoga sessions on stand up paddleboards is now the thing. No matter what your experience or level of fitness, you will be paddling your very first session or floating on your head! Feeling grounded while floating, paddle lessons become natural with yoga techniques applied. Focused and balance sharpen, confidence heighten and playful heart opened. 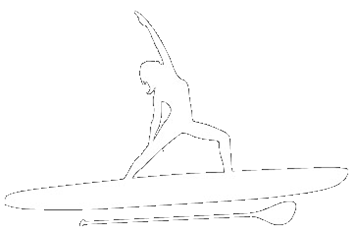 SUP Yoga Ebb & Flow: Intro class all levels As in yoga class we flow and go at our own pace. We start our practice on the yoga mat poolside or calming in a seated floating meditation on the board, getting the feel of the board/mat. The Paddleboard is used as your personal floating yoga mat. The paddle lesson becomes easy and natural in basic yoga poses breathing in the natural fresh air and tranquil sights you will be UP and Paddling before you know it. A peaceful paddle out to anchor down for a slow flow practice, a blissful floating savasana, picture taking and challenging pose play on the paddle back to land. Excited to try it again! Sunset Yoga & Pilates: Paddle Group with paddle lesson, a taste of Yoga and Pilates on the board. Best way to see the sun setting ON the Water! 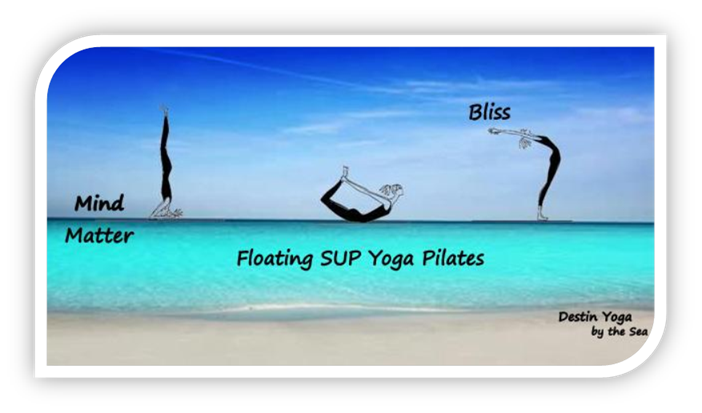 What better way than in a relaxing yoga pose "floating"
Fluid SUP Yoga: For those with some experience in yoga, no worries if you are new to stand up paddle boarding, it comes natural for yogi’s willing to get wet and up for a fun new challenge. This class takes your favorite Vinyasa yoga routines and puts them on your floating mat. Leave your ego behind and enjoy the fun new mission to master poses that come with ease on land. 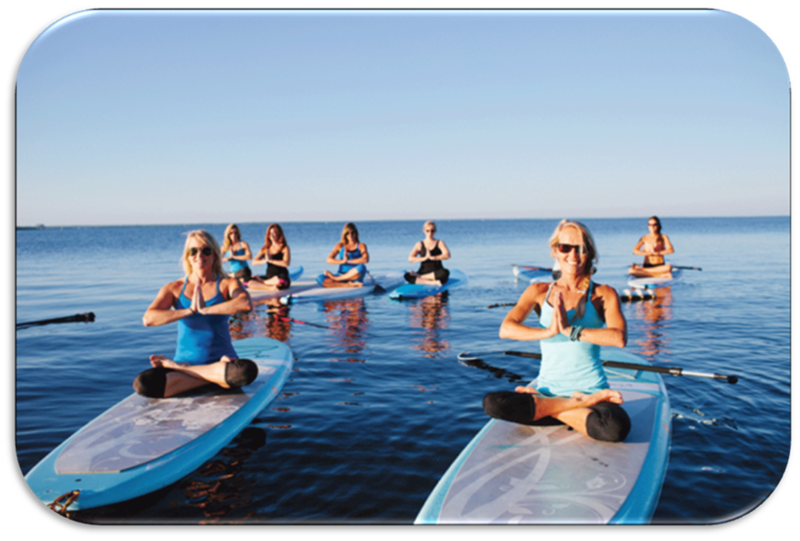 Personalized Yoga Paddle Lessons 1-6 students Feel at ease with a one on one stand up paddleboard lessons with a yoga theme and a short paddle adventure customized for your needs or group energy. 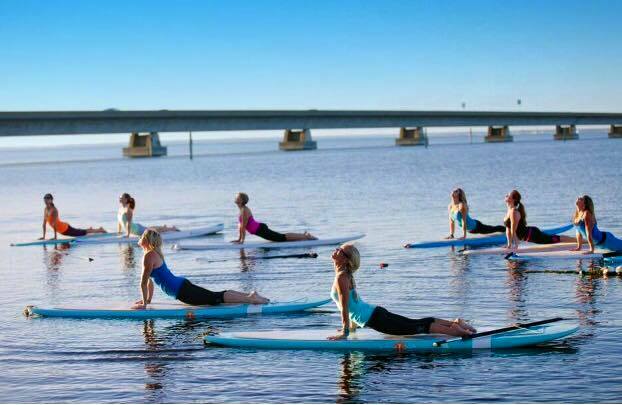 Make it a Yoga Paddleboard Party! Personalized to suit your groups needs, paddle lesson included with a long or short adventure. Can add Yoga at the Beach or Yoga Poolside than out on the board centered and balanced. We have hosted some awesome Family Reunions kids to grandpa, Birthday Parties, Bachelorette and Bridle Parties are always fun, especially when a it's a surprise! running shorts... most all workout gear is warn. We do not always get wet. and all your paddle desires.